Inbounder will call a number (4 or 5). The play goes the same for either number called. On "break" #2 and #3 break to there near baseline corner. The called number breaks to the ball. On these illustrations it is #4. Inbounder then tries to get the ball to the number called. (If he has trouble he can call help and the guards can break to the ball). Once #4 gets the ball the guards then break hard up the sidelines heading towards half court. the last is the safety. 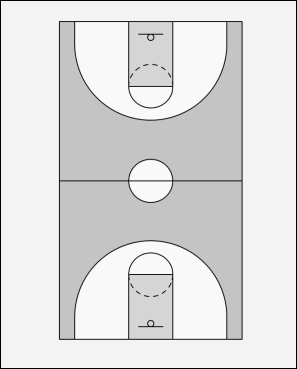 Once the ball gets past half court the players at half court break to the closest block. The called passer goes past half court but stays back as safety. Inbounder is always behind the passer. Once on the wing the ball handler has three options. Either block or the safety and set up the offense.